Here’s the transcript of the talk I gave to the students of the design department of the Sandberg Instituut at LustLAB on the 29th of November. Hello everyone, first of all I’d like to say that I’m very excited to be here. I’d like to thank Anja Groten and Dimitri Nieuwenhuizen for the invitation, and of course all of you for joining. Since you’re attending a master, I’d like to begin this talk with a work that I made while I was a student. Entitled Quest, it is an interactive pun on web galleries. Despites its simplicity, this was for me a very meaningful work because at that time I had to quit my master and I had no idea what to do next. I felt anxious and perceived that period as a life crossroad. Not so long ago, I felt the same: I was on the verge of discussing my PhD dissertation and, again, I had no idea of what was coming next. But now I was 6 years older. Would I need rebrand myself in order to find a job? If so, how? My impression was that academic records weren’t particularly appealing to employers. While I was asking myself these questions, I started noticing that this kind of obsessive refrains were extremely common among my friends. 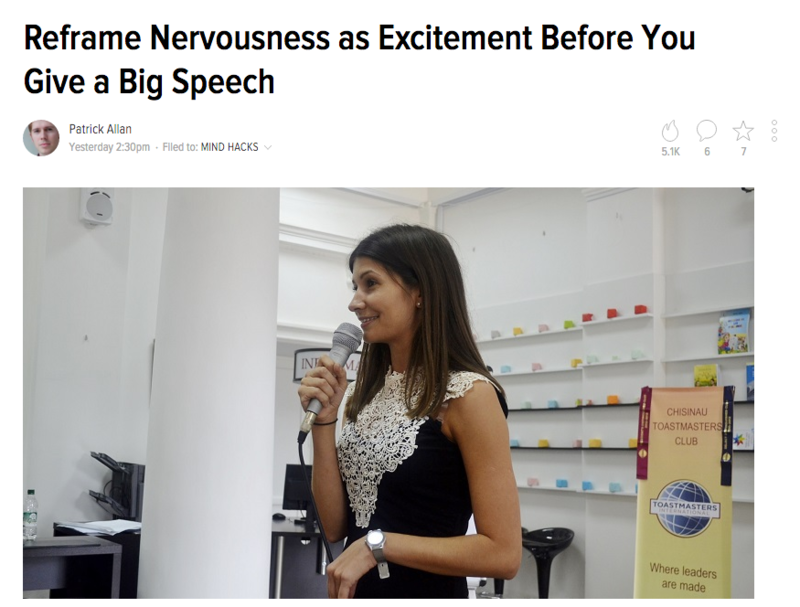 I also realized that this was a specific form of anxiety that could be called "entrepreneurial terror", an expression borrowed from a 1987 Inc. article by Willson Harrell. My friends and I experienced an anguish that is fundamentally entrepreneurial because it has to do with conceiving oneself as a company. This is how I became interested in entrepreneurship in a broad sense. In my perspective, one of the most prominent cultural signifiers of this attitude was crowdfunding. In fact, several people in my extended network were using crowdfunding in order to sustain their artistic or curatorial practice. This is how Kickended came to life. 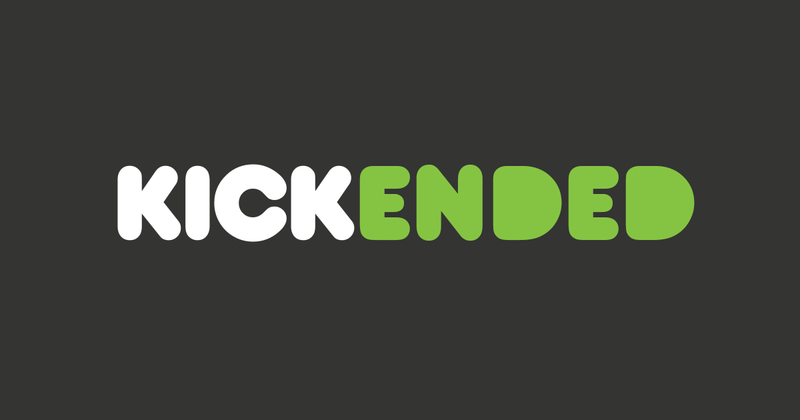 Kickended is a Kickstarter clone that only includes campaigns nobody wanted to pledge for. Campaigns that raised exactly zero dollars. 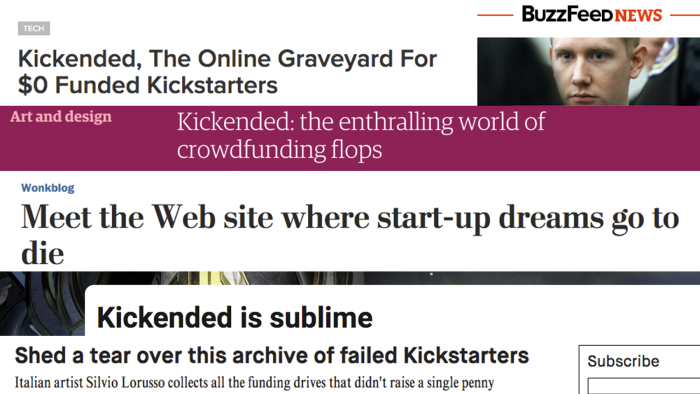 By building it, I wanted to react to the overly optimistic narrative around crowdfunding and expose its ‘dark side’. In other words, I wanted to encourage a realistic perspective on the much hyped micro-entrepreneurship. Kickended is a treasure throve of unrealized ideas. Among other things, I found horror B-movies, Christian rap bands and ‘potato salad’ spinoffs. 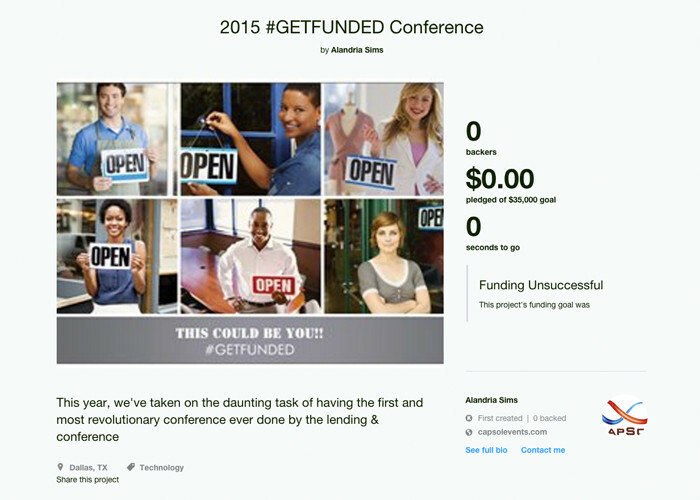 My absolute favorite though is this campaign to fund a conference about getting funded. Soon, magazines and newspapers started to write about the piece. 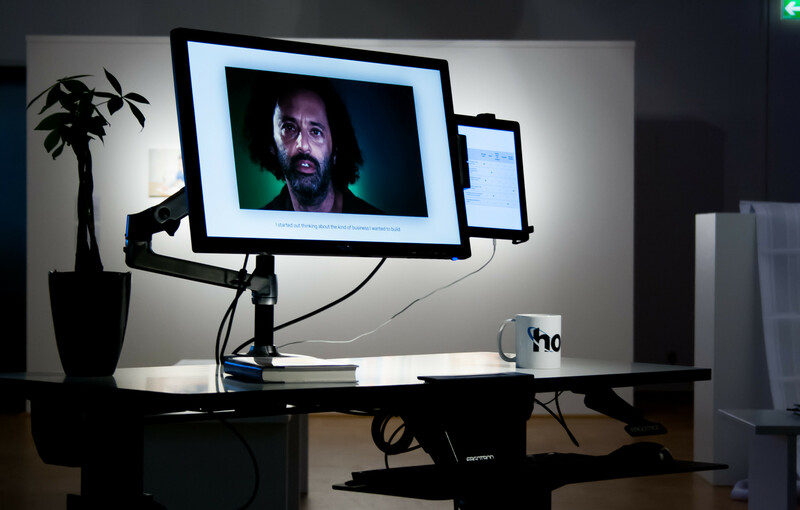 I did a dozen interviews with, among others, The Guardian, The Washington Post, and Wired. Generally, the last question was: “now that you saw all this, what are your suggestions for a successful campaign?” Kickended was now seen as a strategic asset. In this perspective, failure itself becomes instrumentalized, a necessary tool to achieve success. Beckett famously declared: "Ever tried. Ever failed. No matter. Try Again. Fail again. Fail better." With this he meant that "there’s no such thing as success. It’s failure all the way down". But nowadays his maxim is converted into a motivational platitude. The practice to frame negativity as instrumental positivity led me to think of how founders balance their optimistic public image with the inner structural pressures they constantly face. I became interested in how they combine public entrepreneurialism with emotional and psychological precarity. So I created a piece entitled Fake It Till You Make It. 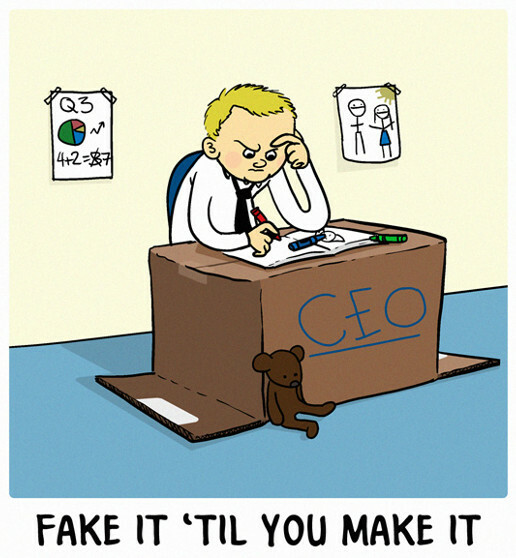 "Fake it till you make it" is a common expression in the world of startups, where it refers to the practice of pretending that a product or a service is already functional while convincing investors. Sometimes this is also recommended as a way to cope with depression: fake happiness until you feel happy. My attempt was to employ the pervasive narrative of disruption and innovation to distill the tragic connotation of entrepreneurship. Jody Sherman and Austen Heinz had several things in common: they were both founders and CEOs of a tech startup, they frequented the same circle of ‘angel investors’, and they both committed suicide while leading their companies. This project shows how the entrepreneurial attitude might be entangled with precarious financial, professional, or emotional conditions. I call this entanglement entreprecariat. According to Guy Standing, "the precariat consists of those who feel their lives and identities are made up of disjointed bits, in which they cannot construct a desirable narrative or build a career, combining forms of work and labour, play and leisure in a sustainable way." If we agree with this definition, we will also admit that entrepreneurialism is one of the most common response to this condition, which affects very diverse social groups. Entrepreneurialism is deeply concerned with the optimization of time, body, mind and soul. The notion of productivity is therefore crucial and, since your course involves "instrumental power", I’d like to focus a bit on productivity apps. 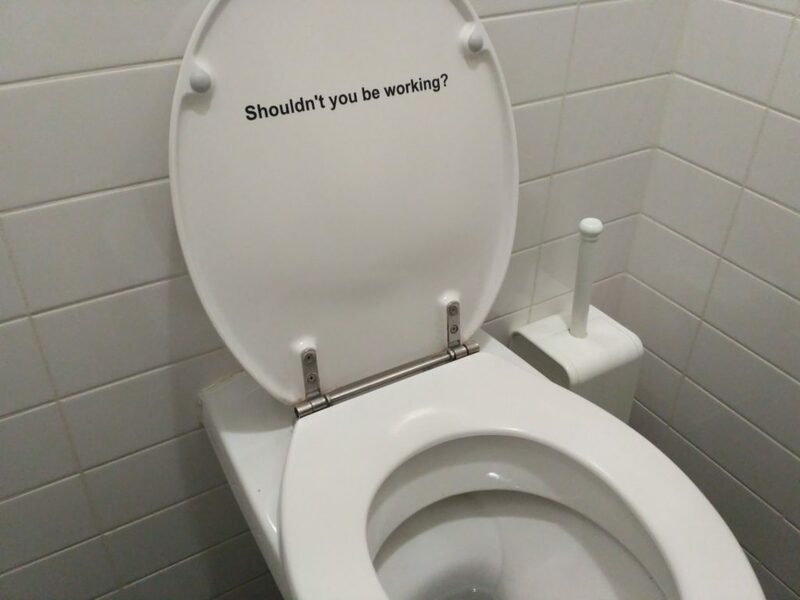 I found this in a presentation about productivity. App stores are full of weird productivity apps. One of my favorites is Productivity Owl, an extension that embeds an owl on a perch into every webpage. At the end of the allotted time (30 seconds by default), the owl soars and heads for the current tab in order to close it. If you are nimble enough you can stop it. However, after a few seconds the owl will insistently start crying and eventually it will liberate to complete its mission. The creator of ProductivityOwl claims that he lived for seven years below the poverty line because of his inefficiency. Such systems are fighting what we call procrastination, but what is it exactly? According to some researchers, procrastination has three main characteristics: it is counterproductive, unnecessary, and it causes delay. The problem is that, in an era that is no longer characterized by a clear threshold between work and leisure, any period of recreation, leisure, rest, boredom or contemplation meets these criteria. One of the most used anti-procrastination apps is Stayfocusd. 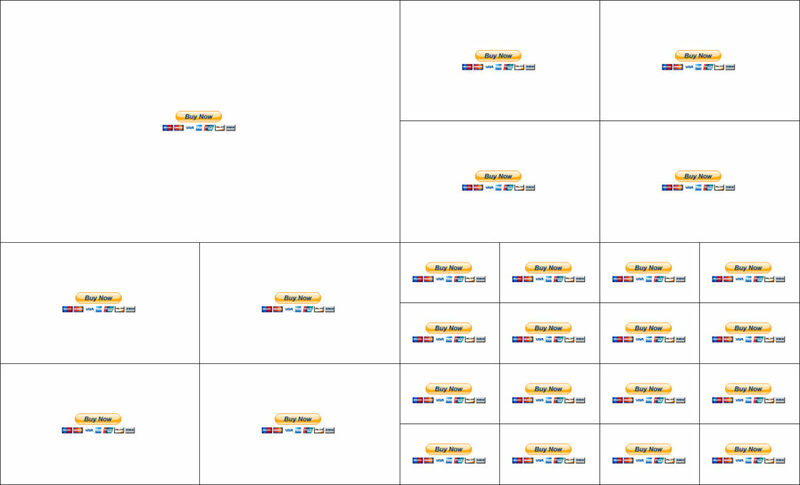 It allows you to select the time-consuming sites and decide how much time per day you can spend on them. 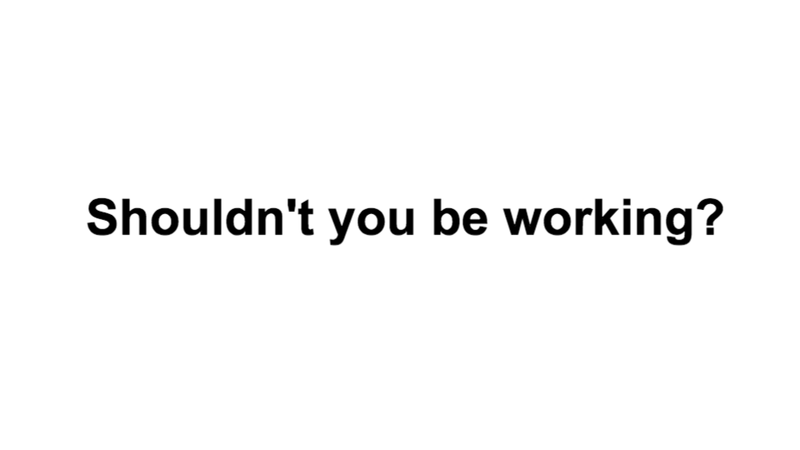 When the time expires, social networks and the like disappear replaced by a white screen that includes a big header asking: "Shouldn’t you be working?" 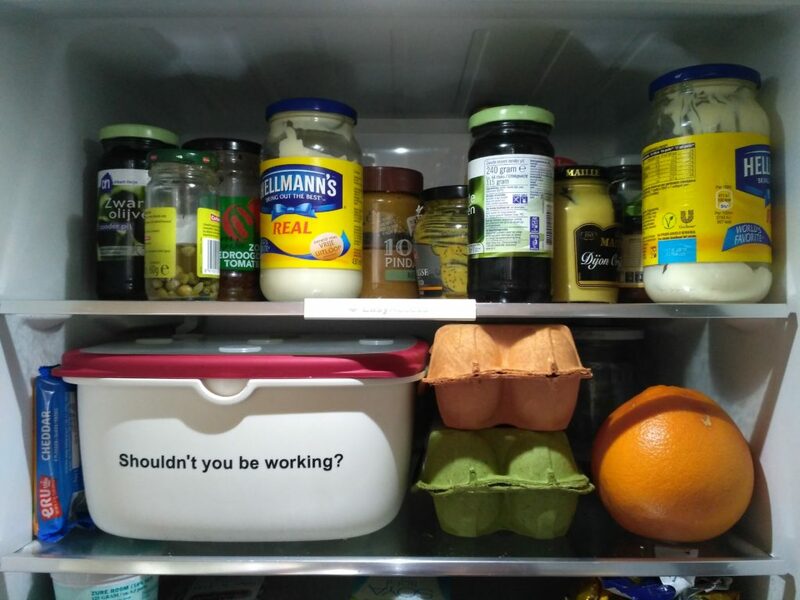 I found this message such an outspoken expression of instrumental power that I decided to make an homage to it, thanks to which lazy-shaming would leak into the physical world. So I made some stickers and sold them to people who started to put them in places I didn’t expect: fridges, windows, ovens, toilets, etc. Many people put them on their own laptop. It’s always startling to see a computer, such an intimate yet authoritative object, decorated with one of these stickers. I was honored to see one of them next to Jenny Holzer, who is obviously a direct inspiration for this project, together with other "sloganists" like Barbara Kruger, Douglas Couplands and Mieke Gerritzen. 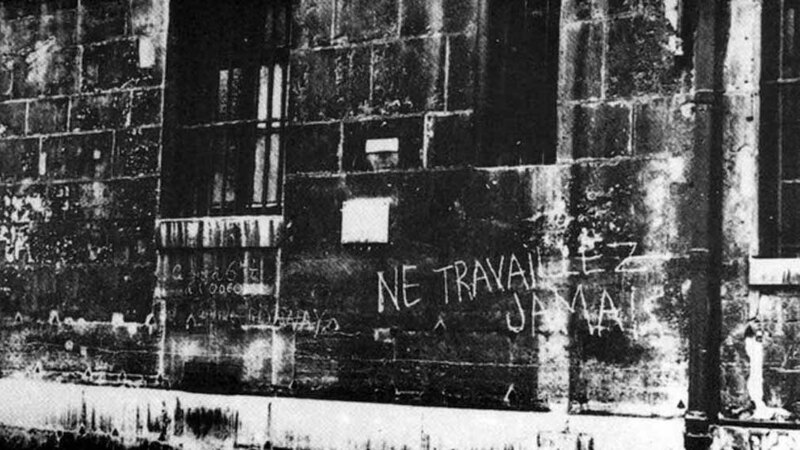 But one particularly relevant inspiration comes from Guy Debord, who in 1953 painted "Ne travaillez jamais" on a wall on the Rue de Seine. 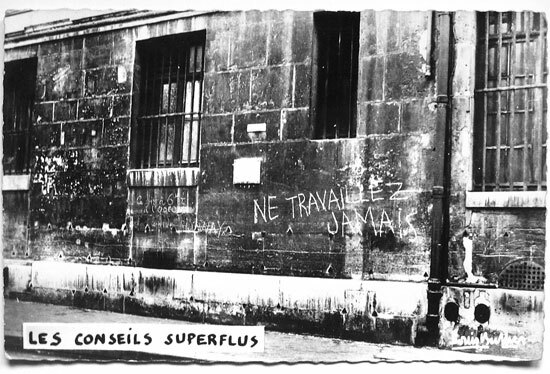 Since we all know that we are constantly working and we already feel guilty when we don’t, the message of my sticker might be considered superflous. But is this awareness enough to change our behavior? It seems not. Earlier I mentioned instrumental power. 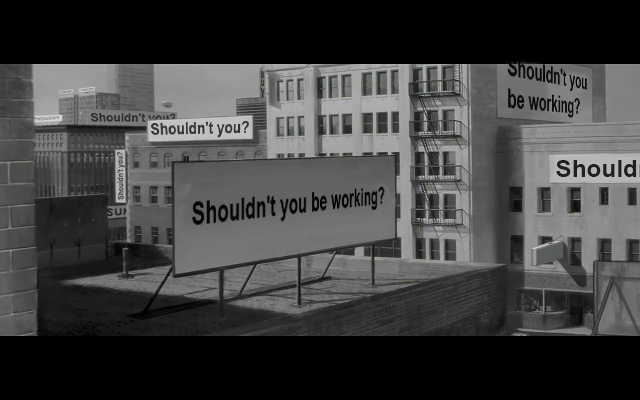 In this respect, I’d like to point out that the voice asking "Shouldn’t you be working?" is primarily in our heads. Thus, I believe that we are the primary instrument exercising power on ourselves. 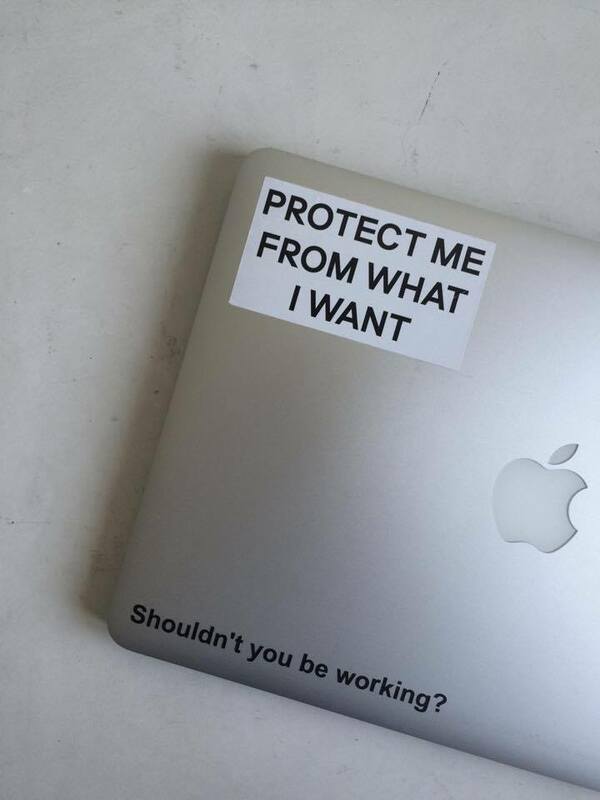 So, my goal with the sticker is to create a work ethic dystopia that would eventually lead us to reconsider our perverse relationship with work. I’d like to take this opportunity to get a bit closer to this goal: I’m going to keep this slide for 30 seconds so you can take pictures and make them somehow public if you like… Thank you. 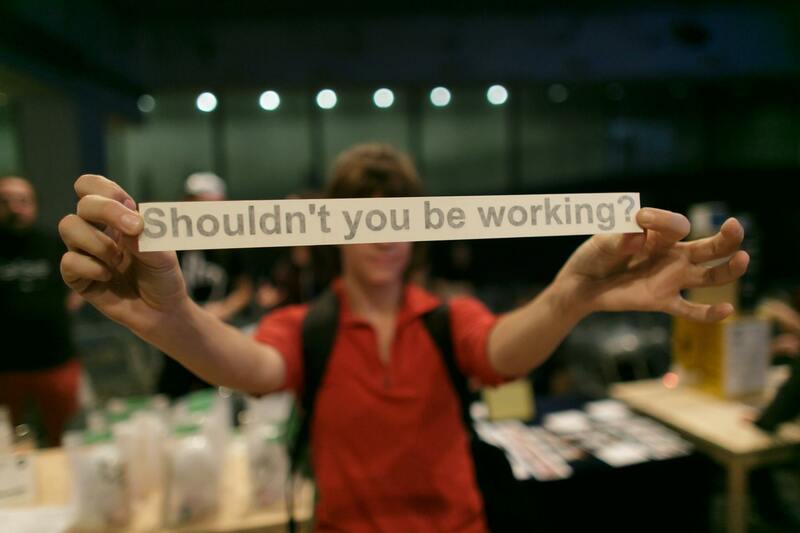 On the opposite side of productivity and work ethic we find leisure and laziness. 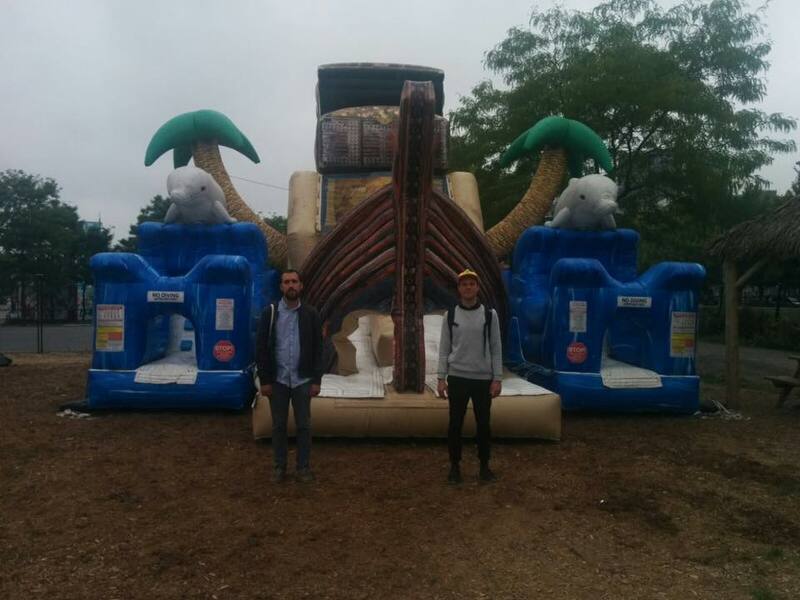 Not so long ago, my friend Sebastian Schmieg and I were invited to participate in an Art Hack Day in Montréal, whose topic was the sharing economy. Since we didn’t have much time in Canada, we wanted to enjoy the city instead of spending day and night hacking. In order to do so, we had to come up with a solution. In the end, inspired by AirBnB and the like, we decided to adopt the strategy of a service provider. 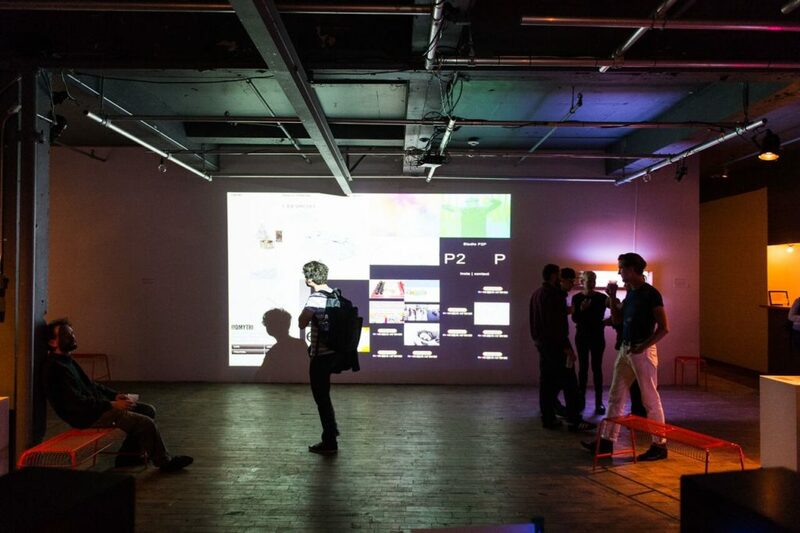 So, we funded Leisure Inc., whose service consisted in selling gallery spots in the Art Hack Day final exhibition. We were able to sell almost all the spots in a few hours and, thanks to that, we had the time to have great fun in the city. Sebastian and I adopted an entrepreneurial attitude to address our temporally precarious situation. I think that, although "conceptual", these type of tactics can be part of the multifaceted strategy of the entreprecariat. The short-term objective is externalization: entreprecarity is first and foremost a worldview, an interpretation of reality that orients our behaviors. This worldview, that is at once embedded in the technological apparatus and incorporated by individuals, should be externalized. 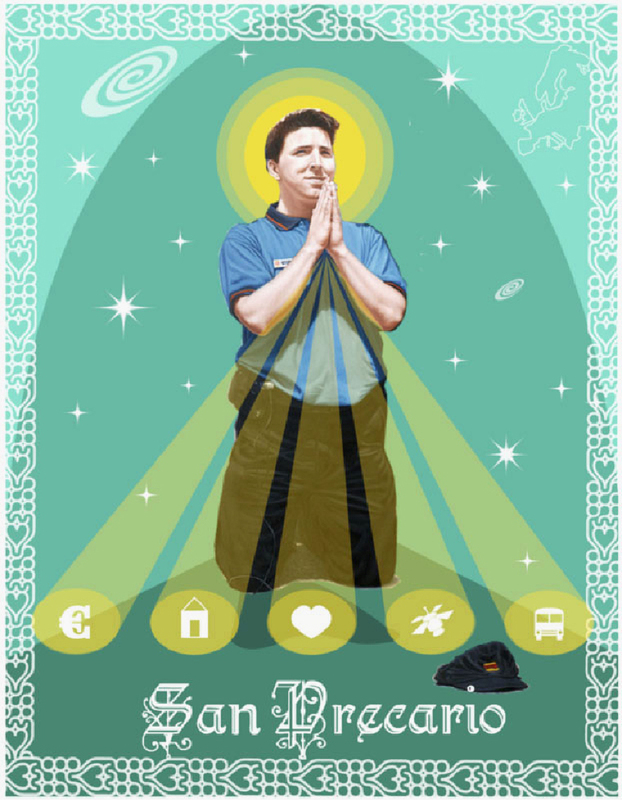 San Precario, an attempt to appropriate the narrative of the precariat. Precarity is hidden and disguised. It’s not a label people use to define themselves. While in the Netherlands "the precariat" is mostly an academic term, in Italy the term is constantly used by news media with a not-so-veiled negative emphasis. You don’t hear people say "I’m a proud member of the precariat". In order to tackle precarity, openness and social cohesion are necessary. We need to take advantage of wit, irony and sarcarm to recombine our collective understanding of precarious conditions. This is what the entreprecariat should be about. Nick Srnicek and Alex Williams maintain that "changing the cultural consensus about the work ethic will mean taking actions at an everyday level, translating these medium-term goals into slogans, memes and chants." The entreprecariat must produce its own slogan, memes and chants. A novel series of tactics needs to be developed, but the fundamental mission is one: to construct solidarity under externalized precarity in order to reclaim agency. An ironically-detached, self-reflexive entrepreneurialism can help.